The holidays, to stress or connect? Although it can be a stressful time of year, it’s also a wonderful time to spend with your loved ones. 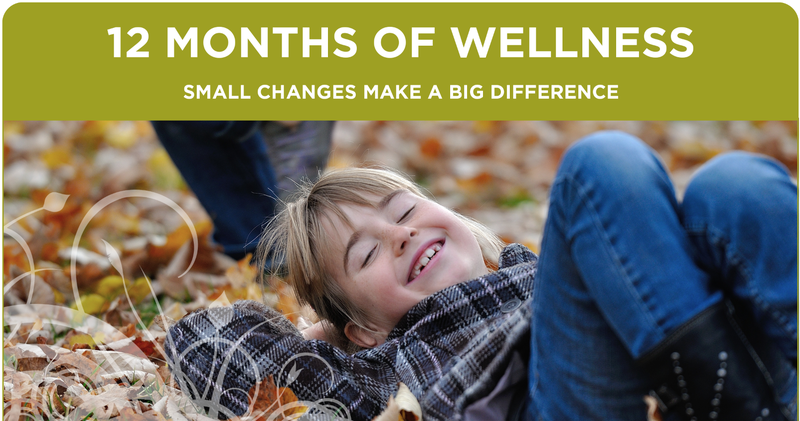 This month we remind you how important community and connection is to your wellbeing. Humans are social creatures whose health and happiness depends on connecting with others. People have basic emotional needs to feel safe, loved and accepted. Studies have shown that people are happier when they have a community they connect with. Community allows you to feel loved and supported while also giving you the sense of being part of something larger. Having a supportive community gives you the safety to try new things knowing that your basic survival needs are taken care of. Research also shows that people are physically healthier when they have a strong social network. Loving connections boost our immune systems by reducing stress, and quicker recovery times are reported when we do get sick. What’s so interesting is your sense of community and connection is directly related to your own inner sense of connection, not the number of people you have in your life. Through having a positive mindset in social situations and setting an intention of building strong social bonds you can nurture and build your internal sense of connection. Plan a date with someone you haven’t spoken to in a while. Start up a conversation with someone new at a social gathering. Play an icebreaker game at a family holiday celebration. Find an accountability partner to talk with regularly and support each other in following through with goals. Give out compliments freely to all the people in your life. Your sense of connection depends on you. What will you do to build and strengthen your community? Download this month’s Intention Setting Guide to get started. We all want to be happy. What’s the simplest way to a happier life? Gratitude and laughter. With Thanksgiving right around the corner we’re sharing the amazing health benefits of laughing and expressing your gratitude and encourage you to work them into your daily routine. Gratitude and laughter are great allies in making you happier and improving your overall mental and physical health. Aside from being fun, both have stress reducing effects and are some of the simplest and effective ways to improve your mood. Expressing your gratitude isn’t just about counting your blessings. There are many positive health benefits that include reducing stress and changing your brain chemistry to make you happier. People who express their gratitude regularly are much happier than those who keep it to themselves. The simple act of expressing your appreciation creates new pathways in your brain and produces serotonin and dopamine, two chemicals that are responsible for making you happier. Laughter has similar mental and physiological effects. Laughing releases endorphins in your brain making you feel peaceful, calm and euphoric. The short-term effect of laughter can increase circulation and make you feel much more relaxed. Over the long-term, these positive benefits can strengthen your immune system and increase your ability to deal with stressful situations. Start a gratitude journal and write three things you’re grateful for every morning and every night. This can be as simple as “I’m thankful for the sunshine”. Allow whatever comes up each day and don’t over think it. Use your social media accounts to share what you’re grateful for and inspire others. Do this consistently and invite others to do the same. Express your gratitude for the people in your life on a regular basis through email, in person or, to make it extra special, through snail mail. Laughter and gratitude really are the best medicine because they not only calm the mind, they heal the body as well. What will you do to add more happiness to your life? Download this month’s Intention Setting Guide to get started. It’s officially fall and that means shorter days and dropping temperatures. It also means cold and flu season is upon us. So how do you protect yourself and your family from catching the crud that’s inevitably going around? Tending to your immune system is your first defense against the aches and pains and stuffy noses of the colder months. This month we wanted to share advice from our Naturopathic Doctors, Dr. Tiffany Binder and Dr. Paris Stevens, to help you stay healthy this fall and winter. Make it a habit to have your vitamin D tested every fall/winter. Good vitamin D levels will keep your immune system in tip top shape. For the fall and winter take Vitamin D daily, if your level is low take Vitamin D Supreme (1 capsule with food). If your levels are normal take Vitamin D Synergy (1 daily with food). Make sure you are taking a high quality multi-vitamin daily. If you are skipping out on this your body is missing out on essential nutrients that keep you healthy and ward off any unwanted viruses from attacking your system. Not all multi-vitamins are created equal, be sure you buy a high grade multi-vitamin. We recommend our Twice daily multi from Designs for Health (take 2 per day). NOTE: It is important to get a multi-vitamin without iron unless you are anemic. If you are a female add a calcium supplement, such as Osteoforce (take 2 per day). Take a daily probiotic. Probiotics help boost your immune system and help with gut health. Take Probiotic Synergy once a day with food. NOTE: Don’t take if on a blood thinning medication. Take fish oil daily and quality matters, there are so many brands on the market that are low grade fish oils. Omega Avail Marine by Designs for Health is a top notch fish oil (take 2 per day). This is also a great time to test to find out which micronutrients you are deficient in. At The Wellness Center, we offer the Comprehensive Micronutrient Panel by Spectracell Laboratories. It is a wonderful test, that measures the function of 35 nutritional components including vitamins, antioxidants, minerals and amino acids within our white blood cells. For more information visit Spectracell. If you are interested in finding out more information on the test please call us at 303-357-9355 to schedule a 30 minute consultation with one of our Doctors. Even after taking and doing all of the above, if you still feel a cold coming on (symptoms: sore/scratchy throat), the best thing to do is treat it ASAP. Take the following at the 1st onset of any symptoms within a few hours, don’t wait. And REST, REST, REST, drink plenty of water and avoid alcohol and sugar at all costs. Once the virus has set in, it is much harder to treat. If you have any other questions or concerns please don’t hesitate to book an appointment with Dr. Binder or Dr. Stephens at our office or call: 303-357-9355 and we can address any questions over the phone. September is National Yoga Month and we’re inspired to help educate you about the health benefits of yoga and stretching. Yoga is a mind-body practice. What this means is yoga helps to strengthen the interconnection between your mind and body. Research shows the importance of your mind on your overall health and vise versa. Your thoughts, beliefs and emotions can directly affect your physical health. This can be a positive or negative influence depending on the quality of your mind. The connection goes both ways. The condition of your body, what you eat and how often you exercise can have a direct affect on your mental state. Let’s first take a look at how yoga and stretching affect your body. In a yoga class you are lead through a series of poses to stretch and strengthen your body. Consistent stretching exercises are important to your physical health because your entire body is interconnected. Tightness in the muscles and ligaments can cause back pain, improper alignment, and poor posture. – Also check: MMA Gyms In San Diego. Beyond just stretching and increasing your flexibility; yoga strengthens your muscles, increases blood flow, helps to prevent joint degeneration, reduces blood pressure, and ups your immune function. Yoga also affects your mental well-being in positive ways. It improves your overall mood, reduces stress and increases your self esteem. Yoga benefits your mind and body making it a wonderful practice to incorporate into your healthy lifestyle. This month we would like to focus your attention on getting enough Vitamin D through the proper amount of sunshine. Vitamin D deficiency is a world-wide epidemic, even here in Colorado, where we have 300 days of sunshine per year. Vitamin D is a major player in supporting immunity in the body, so without it there is a barrage of issues that can ensue – from a simple cold to cancer. The common symptoms of deficiency are having low immune function which means a higher risk of contracting colds, flu, and other respiratory tract infections, feeling depressed, tired or fatigued, experiencing a low mood (especially in the Winter). Chronic and long term deficiency has been linked to at least 17 varieties of cancer as well as heart disease, stroke, hypertension, autoimmune diseases, rickets, diabetes, depression, chronic pain, asthma, osteoarthritis, osteoporosis, muscle weakness, muscle wasting, birth defects, periodontal disease, and more. Vitamin D is produced in the body when skin is exposed to the sun. Doctors recommend 10-20 minutes daily exposure of as much skin as possible and without applying sunscreen. This helps the body absorb calcium, one of the two minerals essential for normal bone formation and health. Additionally, Vitamin D is responsible for modulation of cell growth, neuromuscular and immune function, reduction of inflammation, and more. If you think you may be deficient, increasing your daily dose of sunshine can help and you can receive additional support support through Naturopathy and Nutrition. It’s summer and one of the best ways to stay healthy is to stay hydrated. This month we invite you to stay hydrated by setting the intention to take in more water all day long. Our bodies are made up of up to 60% water. Every cell in our body needs water to function properly. It provides us with the essentials to keep us feeling great. Water lubricates our joints so we can stay active and pain free, it produces saliva which aids in proper digestion, it flushes our system of waste and toxins to keep us feeling healthy and helps to control our metabolism to maintain proper weight. Summer weather is heating up, and it’s even more important to stay hydrated. Spending time in the heat and being more active increase our chances of dehydration. Common symptoms of dehydration include headache, muscle cramps, dry mouth, dry skin, dizzy spells, sleepiness and problems with concentration. These signs usually show up when we have been dehydrated for some time. To avoid dehydration symptoms and keep your body in top shape, take in lots of water throughout the day. Drink lemon water every morning. The health benefits include reducing inflammation in the body, helping to flush out toxins and boosting your immune system. Add watermelon, water and ice to a blender for a refreshing drink. Fill a glass pitcher of infused water by adding fruits and vegetables and keep it cool in the refrigerator. Cucumber and strawberries make for a delicious subtle flavor. Commit to drinking water in between meals, instead of snacking, to curb your appetite. Add more raw, whole foods to your diet. Fruits and vegetables include a high amount of water per serving. Make a game out of drinking water and track how much you drink every day. Download a water tracking app for your smartphone to make keeping track super easy. Use this months downloadable worksheet to set your intentions for how you will stay hydrated and see how much better you feel. 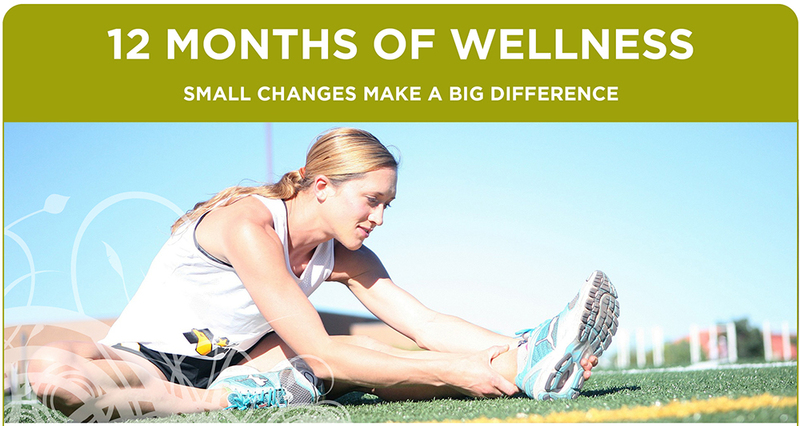 This month we are encouraging you to move your body every chance you get. It’s summer and the perfect time of year to introduce more physical activity to your routine. There’s more reason than ever to move your body. Studies are now showing that Americans are literally sitting themselves to death. We sit in long commutes to work, we sit behind a desk for eight or more hours per day, then when we get home and sit in front of the TV to relax. Sadly our modern lifestyles require less movement in our day and that means our overall health is at stake. Sitting for long periods has been linked to type 2 diabetes, high blood pressure and blood sugar, obesity, unhealthy cholesterol levels and has even shown to increase the risk of death from cardiovascular disease and cancer. It has also been reported that going to the gym a couple times per day doesn’t counter the effects of sitting. The benefits of moving your body throughout the day are numerous. When we sit our bodies natural process to break down sugars and fats halts. The simple act of standing turns that process back on and is so important to keep us healthy. When we add more exercise to our day we burn more calories and that’s great for our waistline. Movement also encourages a healthier mental state. Use this months downloadable worksheet to keep yourself happy and healthy and do what you can to get up and move your body throughout the day. 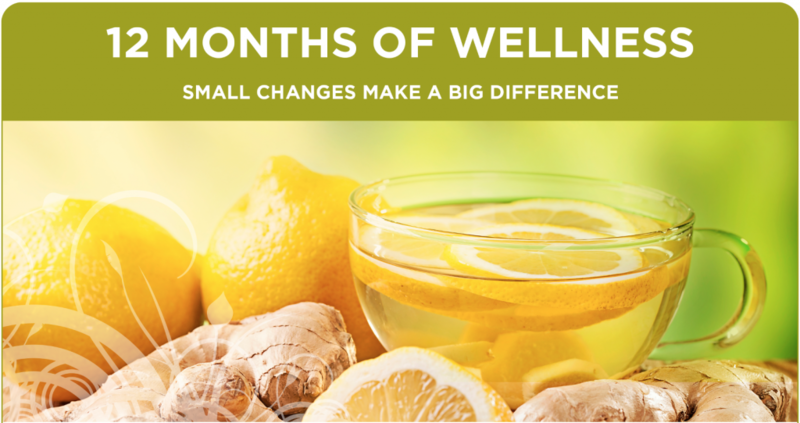 Welcome to month five of our 12 Months of Wellness. 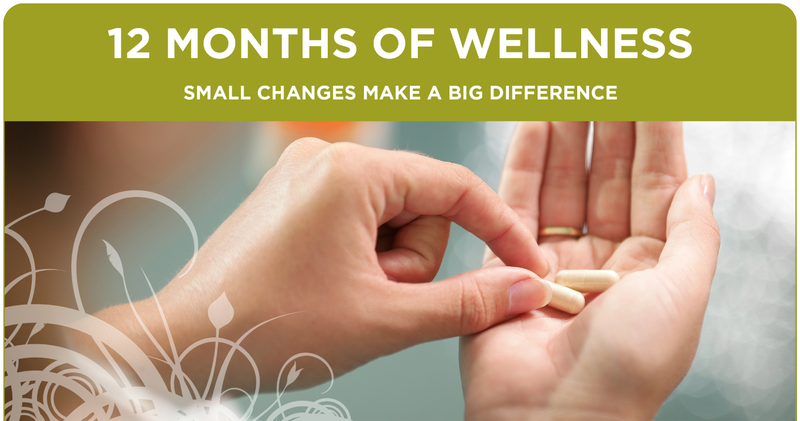 We are so thrilled that you are taking these monthly steps to improve your overall wellness. 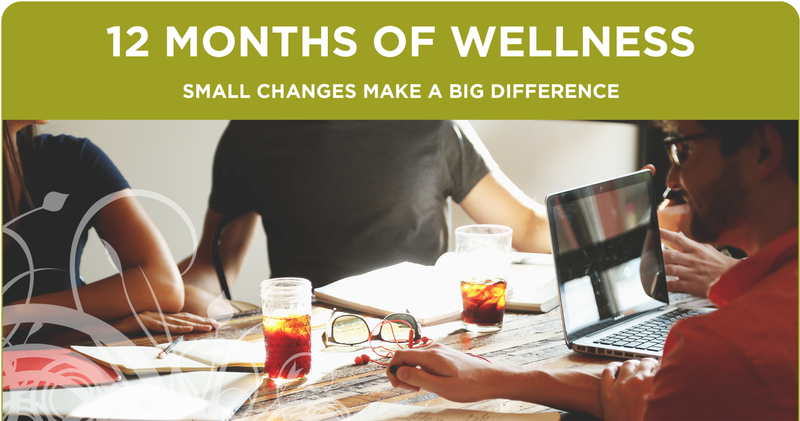 If you are just now being introduced to our 12 Months of Wellness you can find the full series here. Our breath is so much more than just an automatic response to keep us oxygenated and alive. Our breath is the simplest tool we have to calm our physical, emotional and mental states. Next time you’re running late, feeling stressed at work or anxious about an upcoming event tune into your body. You’re likely to notice that your heart is racing and your breathing is short and high in your chest. This is because you are in a heightened stress response and your body is on high alert. The quickest way to relax your nervous system is through conscious breathing practices. This can be as simple as focusing on your breath and consciously taking several slow, deep breaths, fully filling your lungs. The 4-7-8 Relaxation Breath, recommended by Dr. Andrew Weil, is a technique to help you relax, quiet your mind and even fall asleep easily. This practice is simple, doesn’t take much time and it’s free, so try it next time you need to calm you nerves. Exhale all of your breath through your mouth. Exhale audibly through your mouth for the count of 8. Repeat this several times and notice how it helps you relax. You may wonder what the connection is between breath and chiropractic. Well, both actually have a direct effect on the health and function of the nervous system and can affect our ability to heal, as well as feel balanced and calm. Often times, our breath can even be a gauge for our spinal wellness. When our spine is out of balance, we may experience a shortness of breath caused by a stress response. A misaligned vertebrae at the base of our skull can create pressure on our brain causing the release of stress hormones, putting us in a flight or flight response. Chiropractic adjustments relieve pressure and help to activate the parasympathetic nervous system, our natural state of relaxation. Use this months downloadable worksheet to tune into your breath and set intentions to address any issues you may be experiencing. If you commit to a regular conscious breathing practice and still find yourself anxious and out of sorts it may be time to visit a Chiropractor. Click here to read more on Chiropractic Care. 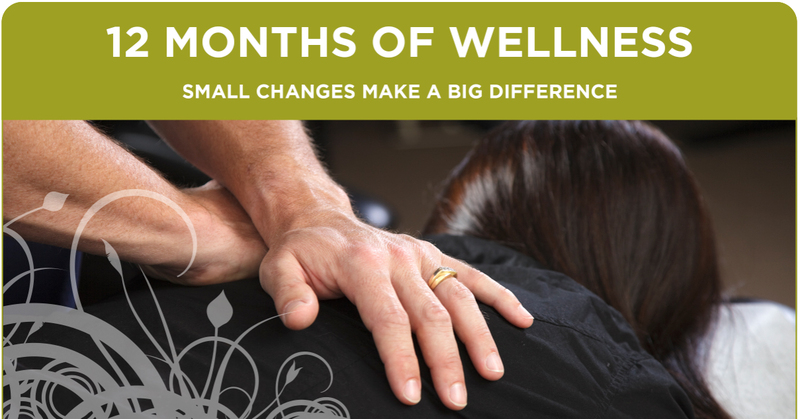 Welcome to month four of our 12 Months of Wellness. We want to congratulate you if you’ve made it this far. 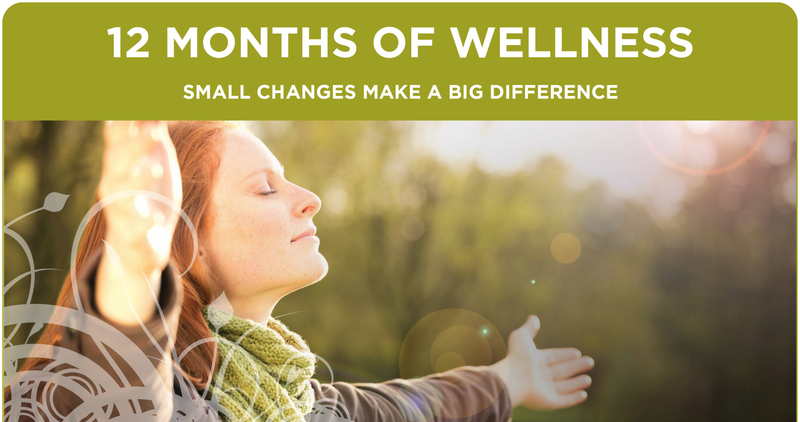 If you are just now being introduced to our 12 Months of Wellness you can find the entire series here. This month we are helping you understand the connection between sleep, stress and overall well-being. We invite you to check in with your sleep patterns and make some minor changes to your day if you find yourself ever having trouble sleeping. Most adults have experienced insomnia or sleeplessness at one time in their lives. An estimated 30%-50% of the general population are affected by insomnia, and 10% have chronic insomnia. The concern is if you don’t address short term sleeplessness it may develop into chronic insomnia. In our fast-paced lifestyles, stress can often cause us to give up sleep in order to catch up on work or other responsibilities. This can cause us problems when trying to fall asleep and many of us reach for over the counter or prescription sleep aids which only put a band-aid on the problem, rather than address the root of the cause. Acupuncture is effective in treating stress induced sleep issues by balancing the endocrine/hormone regulated activities. Chronic stress causes our stress hormones to become hyperactive, this in turn suppresses our feedback hormone. Acupuncture helps to regulate the endocrine system by needling acu-points selected for the insomnia and our bodies adjust the feedback system and normal sleeping are patterns restored. Sleep problems due to medication and some other physiological causes span from circadian rhythm disorders, sleep-wake imbalance, to a variety of medical conditions are more complex to treat. If you need a day off work then check out this article to get a sick note. This will take a longer period of time to treat the underlying conditions and causes of the sleep issues. You do not have to put up with sleepless nights. Simple changes in your daily habits like getting to bed at the same time every night and turning off the computer and tv screen well before bed can resolve short-term sleeplessness and restore your much needed rest. Use this months downloadable worksheet to assess your sleeping patterns and set intentions to get a better night’s sleep. Dr. Tsai is our on-site Acupuncturist and she can help you with any sleeping issues you may be experiencing. Remember short term sleep problems can develop into chronic insomnia, schedule a session today. Click here to learn more about Dr. Tsai. Click here for more information on sleep and insomnia. This month we encourage you to set some intentions around healthy nutrition. What we ingest has a direct and sometimes profound impact on how we feel, how our body resists disease and ages over the years. Start tuning into how food can support your heart and soul, what you want to fuel your body with and why, and make choices based on what feels right for you and your body type. There are so many philosophies in the nutrition field and it can be overwhelming to keep up with the latest fads and research. That’s why we suggest you start with an intention to make small shifts in your diet. This will help you follow through long-term and see huge benefits in the way you look and feel. The Mayo Clinic talks about a “Heart-Healthy Diet: 8 steps to prevent heart disease” that is a great place to start when making small changes to your diet. They outline the following topics with some great basic information. Please read the article with an open mind and remember our two-cents to this rather Western perspective. Limit unhealthy fats and cholesterol – of course, but don’t get suckered by the gimmicky products promising to reduce cholesterol like Benecol Promise Margarine. Yuck. Olive oil and even butter (used sparingly) are better choices. Choose low-fat protein sources – but skip the fat free dairy and soy products all together. Eat more vegetables and fruits – FRESH fruits and vegetables that is. High heats during canning can turn these gems into nutrient-less mush. Select whole grains – The words “whole grains” have been bastardized by cereal and other packaged food advertisers. We are talking about the actual whole grains of brown rice, quinoa, buckwheat, barley, oats. Reduce the sodium in your food – by NOT eating foods laden with salt like most processed items including canned, boxed, frozen and otherwise. Control your portion size – basic but true. Changing your eating habits can be tough. Make sure you are kind to yourself and set your intentions at an attainable level. Maybe include a new step every few weeks so you are continually working towards a goal. 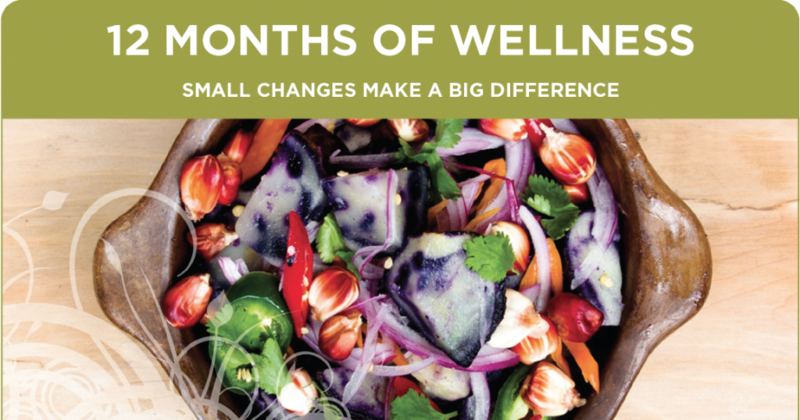 Download this month’s intention setting guide to set healthy nutrition intentions for yourself.